SSD - Solid State Drives. HDD - Hard Disk Drives. If you haven't heard of the differences between these two types of computer storage drives, see the two tables below to give you a quick overview of the differences and pros and cons of both drives. To read more about these two drives, see the links at the bottom of this article or any of the various links in the tables. SSD history: In 1991, SanDisk Corporation was the first to begin shipping SSDs, a 20 MB solid state drive that sold for about $1000. HDD history: HDD drives have been around since the 1950s, first introduced by IBM in 1956. SSDs are more like oversized USB sticks, which you often used for external storage. A SSD has no moving parts, but consists only of a controller and microchips. A SSD’s controller is an embedded processor that has the necessary electronics to access the NAND memory components, where data is stored. HDDs use a mechanical arm with a read/write head to move around and read information from the precise location on the Storagege disk itself, which uses magnetism to store data. An HDD also has a controller which implements these functions. SSDs behave as though the information is right in front of them at all times, because of the microchip construction, so quick access is the norm. HDD behave as though you must travel a distance before actually getting the information, because of traversing various spinning disks, and so therefore take more time to access data. SSD read/write speeds vary from 200 MB/sec up to 550 MB/sec. HDDs have slower speeds because of the time it takes to access the disks. Most laptop HDD can spin at 5400 rpm (revolutions per minute) or 7200 rpm, with some server HDD spinning at 15000 rpm. HDD read/write speeds vary from 50 MB/sec up to 120 MB/sec. SSDs use mostly the SATA interface. HDDs, as well, use mostly the SATA interface. 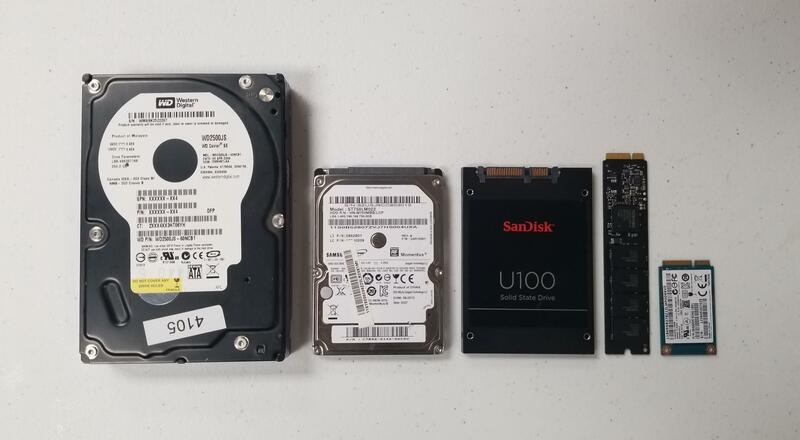 SSD appearance – (see image below for comparison) – generally, most SSDs come in the 2.5 inch form factors. And except for some smaller SSDs that can be placed as a tighter fit on a computer’s motherboard, the 2.5 inch form factor is the most commonly seen SSD for both laptop and desktop computers. Both SSDs and HDDs look similar on the outside. HDD appearance – (see image below for comparison) – generally, most HDDs come in 2.5 inch and 3.5 inch form factors. Laptops will usually have the 2.5 inch form factor and most desktops will use the 3.5 inch form factor. Both SSDs and HDDs look similar on the outside. Faster bootup, and faster speed at accessing applications. Slower bootup, and also slower at accessing applications. Uses more battery power, because requires more energy, due to the moving parts that access data. Safe from the effects of magnetism. Vulnerable to the effects of magnetism, can erase the data. Cost - SSDs tend to be more expensive, roughly $0.20 per GB (based on 1 TB size). The average price for a 1 TB SSD will currently range in price from around $200 to $350, after a quick check on Amazon. Chances of data recovery if SSD is damaged - there used to be the fear that a SSD could eventually lose its data. Since SSDs use NAND-based flash memory, a non-volatile type of memory, it was thought early on that the data would vanish over about two years. However, this has not been happening (as you can attest to, with the typically long life of most USB drives) and in fact, research shows SSD data can last up to 200 years! And because there are no moving parts, SSDs usually don’t fail. Nevertheless, if they do, Gillware is a good data recovery company to check into. Chances of data recovery if HDD is damaged - if HDD plates are corrupted, it is usually not good news. Data on damaged HDDs can be quite difficult to access. However, there is still a slight chance data can be recovered from the disks, especially with companies like Gillware. Speed: SSD read/write speeds vary from 200 MB/sec up to 550 MB/sec. Speed: HDD read/write speeds vary from 50 MB/sec up to 120 MB/sec. Heat produced- SSDs usually produce a minimal amount of heat, since there are no moving parts. Heat produced – HHDs do produce some heat, but it is usually not too severe. Vibration and noise – SSDs have no moving parts, and so there is no detectable noise or vibration from them. Vibration and noise – HDDs do have moving parts, so if you don’t like hearing all the clicking noises and feeling the vibration of the spinning disks, SSDs would be a better choice. Total storage capacity – currently, 30 to 60 TB is the top amount that can be stored on 2.5 up to 3.5 inch form factor SSDs (although these SSDs would be very expensive!). See this article for more. Total storage capacity – currently, HDDs can store up to about 10 to 12 TB. See this article for more. Ware Repair can upgrade the standard HDD on your computer to a SSD, so you can have all the great SSD "pros" described above! See our prices page for more.